Machine learning is one of the most important fields of research for SAP. The Walldorf-based company is driving developments in autonomous agents: assistance systems that use artificial intelligence to support you. In principle, this is nothing new, as just about everyone has already used a digital assistant like Siri or Alexa. But SAP is now applying this concept to business software with SAP CoPilot. The SAP CoPilot is a chatbot, otherwise known as a conversational user interface. 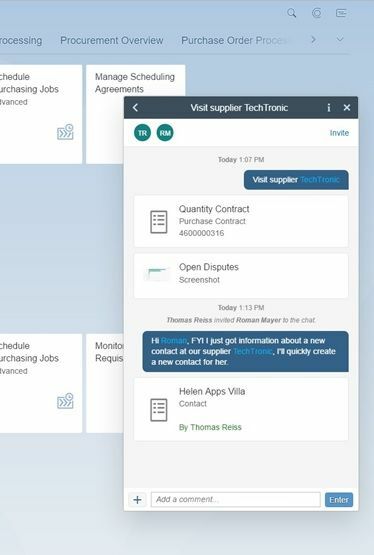 A specific example could be as follows: Your procurement manager notices in the SAP Fiori launchpad that a supplier contract is about to expire. By simply clicking on the SAP CoPilot, the manager creates a reminder to “Visit TechTronic supplier”. In the same chat window, the user can then add new business objects, such as a purchase order. But the SAP vision goes much further than that. In the future, the digital assistant will learn from user input and be able to use the current context and previous experience to predict what a user most likely wants to do next. It can then present relevant information, such as any contracts that have been agreed with the supplier or a list of relevant company contacts. The assistant then shows all business objects in a clear overview – including those that the user might have forgotten without SAP CoPilot. For the moment, these capabilities are still just a vision. But the digital assistant is already useful when human colleagues are brought into the mix. With SAP CoPilot, notes and business objects can be shared with other users. Perhaps your purchasing manager needs to clarify certain risk factors with the supplier before a meeting. Using drill-down functionality in the SAP Fiori launchpad, the manager can see liquidity trends and view the delivery reliability of TechTronic. The purchasing manager can then produce an interactive screenshot and send it to a colleague who works in the treasury via the chat window in SAP CoPilot. This screenshot is then immediately displayed on the same dashboard, which is pre-filtered. Scenarios like this will help make teamwork much quicker and simpler. The most attractive promise behind SAP CoPilot is that I no longer have to actively search for information. My virtual assistant knows exactly what I need – perhaps even before I do. There’s still some work to be done by the SAP developers in order to realize this promise. The ultimate aim is to create a digital assistant that communicates with the user just like a human would – even with its own voice. You can already access an early version of SAP CoPilot using the SAP S/4HANA Cloud via the SAP Fiori launchpad. Soon, it will also come as standard with on-premise systems. itelligence is keeping a close eye on how digital assistants are developing and is collaborating with SAP to establish valuable use cases that help you further. If you find this article cause for concern, do not worry: You will not have to talk to your ERP system in the future if you do not want to.